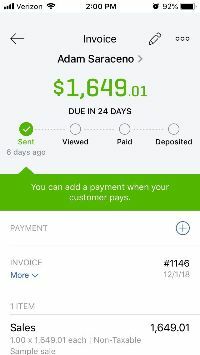 Resolve to do these three things in QuickBooks Online this month! By now, many New Year’s resolutions have already been made –and broken. Though they’re usually created with the best of intentions, they’re often just too ambitious to be realistic. Instead, why not pick three(or more)specific areas and focus on them this month? We’ll get the ball rolling for you by making some suggestions. Give it a name, like “February Budget,” and select FY2019. Leave the Interval at Monthly, and open the Pre-fill data? menu to click on Actual data –2018 (if you have data from last year). Then click Create Budget in the lower right corner. Look at last year’s February numbers and estimate how they might change in 2019. Replace the old numbers with your new ones. Emails. QuickBooks Online sends email messages with forms you can edit them here. There’s more you can do to make your sales forms look professional and polished. We can help you with these tools–and any others you want to explore to expand your use of QuickBooks Online. It’s a new year, and who knows what might come your way over the next 12 months? Contact us if you want to prepare for the new accounting challenges that 2019 might present.